Entry open to any resident of Webster and surrounding counties, male or female. There will be: adult classes (18 years & older) and youth classes (17 years & younger). Exhibits must be fresh plant materials grown by exhibitor. No prefair entries are needed – entries will be taken from 8:30 a.m. to 10:30 a.m., Saturday, July 15, 2017. ENTRY FEE: 25 cents per entry up to 6 entries, $1.50 maximum fee for 6 entries or more. Judging will begin at 11:00 a.m., Saturday, July 15, 2017. The Danish System of placing will be used. All entries will receive a ribbon placing of blue, red or white, depending on quality. 462 entitled “Harvesting and Preparing Vegetables for Exhibits”. This pamphlet is available at the Webster County Extension Office, 217 S. 25th Street, Fort Dodge or at any county extension office in adjoining counties. Categories mentioned in 4H-462 are encouraged with any other fruit or vegetable worthy of exhibiting to be entered. Please note the “Judging Pointers” found on pages 1 and 2 of this pamphlet. Paper plates will be furnished free to exhibitors. Exhibitor tags will be furnished free to be filled out by exhibitor for each exhibit. Exhibits will be released at 4:00 p.m. Saturday, July 15, 2017. OFFICIALS WILL NOT BE REPSONSIBLE FOR EXHIBITS REMAINING AFTER 4:40 P.M. Since the building will be used for other events it is very important that you pick up your exhibits or make arrangements. 1. “Best of Show” entry in the adult classes will be awarded $10.00. “Best of Show” entry in the youth classes will be awarded $5.00. 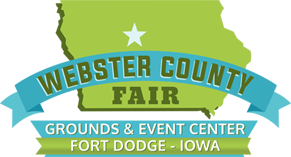 The Webster County Agricultural Association wishes to THANK the Fort Dodge Area Gardeners for all their work during the organization and completion of the Garden Show. Print Form (PDF) then fill out and return. ___No, do not use pictures of my child.